Sorry, you can only order up to 201 units of this product! The average bathroom in the United Kingdom still remains quite small, so finding a bathroom suite that fits within the confines of your room and still leaves a healthy amount of space to move around is paramount. This space-saving close coupled toilet from the Affine Arles collection is ideal for small bathroom suites thanks to the short projection pan. It gives you more leg room and more room in general in which to organise your bathroom suite around. Aside from saving space, you'll also save water. The dual flush push button lets you choose between a half flush for liquids and a full flush for solids, so you won't waste water unnecessarily. 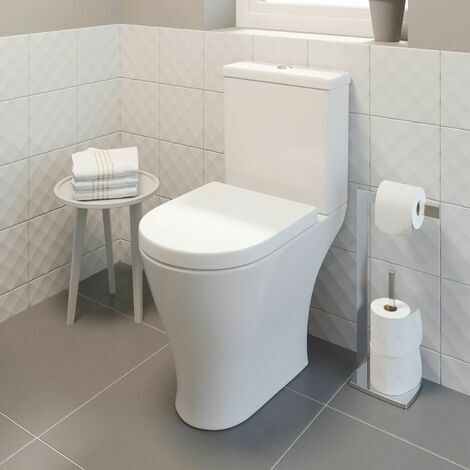 It also features a soft close toilet seat, making closing the seat quieter and removing the risk of impact damage by accidentally dropping the seat.